I love butterflies and would love to win. Have liked totally target for some time now. Target has the neatest gift cards! Thanks for always doing these giveaways! LOVE your FB site and I am a fan! My boys would LOVE this!!!!!!!!!!!!! I already like ‘ya on FB! I am a fan on your fb page! Pick me please! Thanks so much! I already “like” Totally Target on FB! I would like this gift card! Would love to win! Liked you on Facebook! Already a fan on FB!! 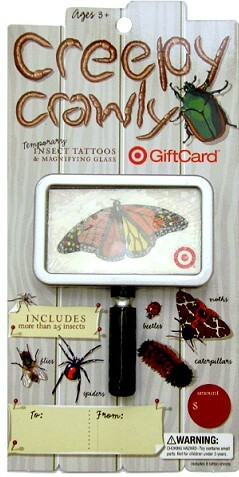 My son’s birthday is coming up, and he would LOVE this giftcard….he is so into bugs right now! I ‘love’ TT on FB! My boys would LOVE this card! Thanks for the opportunity! Totally Target is a great resource. Thank you. I liked you on Facebook!!!!!! I so need this right now! thanks for the giveaway! I like you on FB! Thanks again for the giveaway! HOPE I WIN!!!! THANKS FOR THE CHANCE! I would love to win and send the card to my daughter in college! Wouldn’t go to Target without checking your site first.